Peter and the Starcatcher unfolds the origin story of Peter Pan, and in doing so, invites theater-goers to join a heroic journey. The Williston Northampton School’s theater program presents the play April 27 to 29, and May 4 to 6 at 7:30 p.m. Tickets are available at www.williston.com/theater and go on sale on April 1. They cost $10 general admission and $7 for students and seniors. The young adult book on which this play is based was co-written by humorist Dave Barry, and the play offers contemporary jokes and is told in a tongue-in-cheek style, said Williston Theater Director Emily Ditkovski. 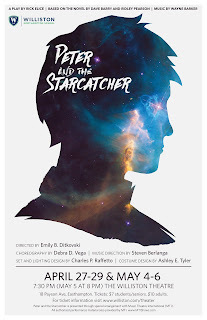 The Broadway production of Peter and the Starcatcher was nominated for a Tony award for best play in 2016. There are pirates, orphans, Brits, and mythical sea creatures interacting on a set that includes creative special effects—a mermaid’s glowing tail, scenery on wheels, lots of “starstuff.” Students are helping stitch the costumes.